Telcos across the world confront several challenges in positioning their product among target customers. They lose to competition often because of their failure in implementing the right marketing strategies and not because of the fault of their products. 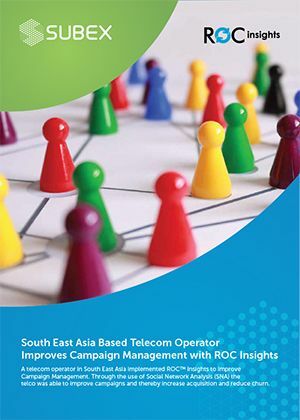 The case study narrates how a Southeast Asia-based telecommunications company overcame the challenges associated with campaign management with the help of Subex ROC Insights. The telco leveraged the Social Network Analytics (SNA) capabilities of the product to build a marketing strategy focusing on the current channels that influence customer acquisition and retention. With proper targeting using SNA, the telco achieved a significant rise in the number of customers per month.